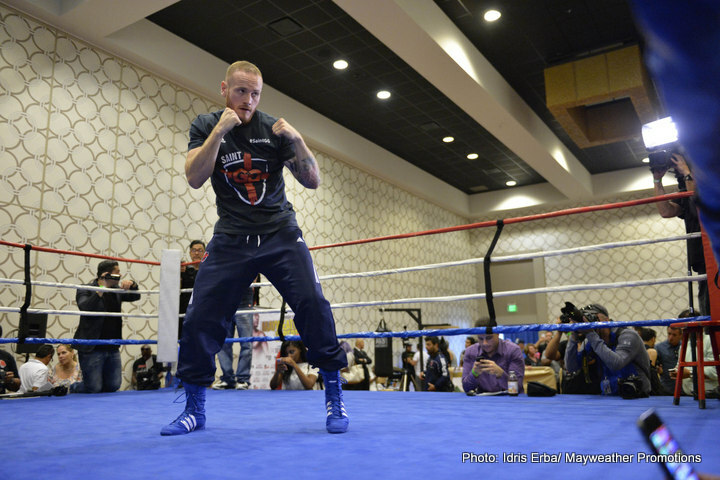 By Scott Gilfoid: Always the great self-promoter, #1 WBC George Groves (21-2, 16 KOs) believes that he’s better in pretty much every department in terms of boxing skills going into his fight against WBC super middleweight champion Badou Jack (19-1-1, 12 KOs) on September 12th at the MGM Grand in Las Vegas, Nevada. Groves feels he’s the better overall fighter, as does his trainer Paddy Fitzpatrick, and he thinks he’s going to go out there and steal the show from Floyd Mayweather Jr. by stopping his Mayweather Promotions fighter Badou Jack in front of the sold out MGM Grand crowd in this fight in less than two weeks. For the 27-year-old Groves, this will be his third world title shot in the last two years, which is pretty incredible accomplishment, given the fact that he’s been knocked out twice in his last two world title shots against former WBA/WBC super middleweight champion Carl Froch. It doesn’t seem to matter that Groves keeps getting beaten. He keeps getting more opportunities despite his losses. It’s both sad and very, very strange. Well, in looking at how Groves performed in his last four fights against Froch, Christopher Rebrasse and Denis Douglin, I think Groves doesn’t need to worry his head too much about becoming one of the “greatest fighters ever.” I’m sorry, I think that pipe dream isn’t a realistic one. Groves should hope that he can somehow beat Jack so that he can get his 15 minutes of fame in being able to hold onto the WBC title for a brief spell. I mean, even if Grove somehow beats Jack, which I highly doubt, it’s not as if Groves will hold onto the WBC title for any length of time. Groves will hold onto the WBC strap as long as his promoters at Sauerland Events match him carefully against beatable opposition. If they slip up and put him in with one of the Dirrell brothers, I see Groves quickly losing his WBC strap. But this is academic at this point. Groves won’t win the WBC title, and there won’t ever be a Dirrell fight in my view. Badou Jack is not a great fighter. He’s a very good one, and one capable of beating a guy with a chin problem like Groves. The areas where Badou Jack is a great fighter is in his ability to pressure his opponents. He’s one of the best pressure fighters in the game right now, and he’s excellent at cutting off the ring on his opponents. As such, if Groves plans on running around the ring on September 12th to play a game of keep away, he’ll wasting time and his precious energy stores. Groves doesn’t have great stamina to begin with, so my advice for him is not to run from Jack, because he’ll only be using up his energy that much quicker. Groves needs to stand in the trenches and fight it out in a last stand type situation. Groves should blast away all of his fuel in the first six rounds in hopes of scoring a knockout during that time of the fight, because if Jack is still standing after the 6th round, he’s going to knock Groves out. I see Groves as a six-round fighter at beat. He loses his power and his stamina after six rounds, and is quite vulnerable. For that reason, I think Jack will have an easy knockout if Groves can’t bang him out by the 6th round. I don’t think Groves rates this world title shot. I mean, he was knocked out twice by Froch, and then the World Boxing Council orders a fight between Groves and Rebrasse in a WBC super middleweight title eliminator. What fighter gets to take part in a title eliminator after they’ve been knocked out twice in a row. That move made the WBC look really, really bad in my view. If that’s how the WBC picks out there fighters to fight in their eliminators, then it just makes them look really bad in my eyes. The last time I checked, you don’t rewarded for losing in other sports like soccer, football, basketball, and hockey.